In October 2015, the Board of Trustees of Phipps Conservatory and Botanical Gardens, Pittsburgh, voted to move our investments in fossil fuels to investments in renewable energy. The initiative was first presented to our board’s executive committee in September and finance committee in October. While this appears to have been a quick decision, the groundwork for this move had been laid over 10 years in which Phipps systematically reviewed and modified operations and programs to make them consistent with its mission and values. When Phipps opened in 1893, people thought there was no limit to the amount of resources we could use or pollution we could produce. Run by the City of Pittsburgh for 100 years, Phipps was transferred to nonprofit management in 1993. In the late 1990s, we started a master planning process primarily focused on improving visitor amenities. We then learned about Leadership in Energy and Environmental Design (LEED), an initiative begun by the U.S. Green Building Council (USGBC) in 2000 to make buildings more sustainable, and we decided to pursue Silver LEED certification for our upcoming Welcome Center. The Welcome Center opened in 2005 as the world’s first LEED-certified visitor center in a public garden. Phipps’ mission is, in part, to advance sustainability and promote human and environmental well-being through action and research. During the design and construction of the Welcome Center, we began to educate ourselves about the rationale behind the LEED certification standards. As we understood more, we asked ourselves, Why stop with the buildings? We decided to look at everything we do. From that point, Phipps’ staff and leadership have taken a holistic approach, examining everything—from amenities to horticulture to operations and beyond—and making all our efforts as green and sustainable as we can. For example, in 2005, we opened our café without any plastic disposable serviceware, and in 2009, we eliminated bottled water. In 2011, we turned our focus to the link between human and environmental health. After starting our own Let’s Move children’s health program, we realized we couldn’t say we care about children’s health yet sell junk food and soda in our café. So we eliminated these items from our menu. Our commitment to the issue solidified in 2012 when we turned down a Let’s Move Pittsburgh sponsorship offer from a major international soft drink company. After the Welcome Center and café, we continued to raise the bar. In 2005, we began offsetting all of our electricity consumption with renewable energy credits. In 2006, we opened the world’s first LEED-certified greenhouses (Platinum certification under the USGBC’s existing building operations and maintenance program) and our Tropical Forest Conservatory, which was the most energy-efficient conservatory in the world when it opened. 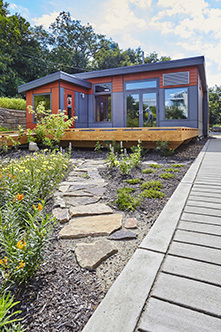 In 2007, we set our sights on a higher standard than ever before when we accepted the Living Building Challenge, the most rigorous green building standard in the world, for our next project, the Center for Sustainable Landscapes (CSL). This research, education, and administration facility, which makes more energy than it uses from renewable energy produced on site, opened in late 2012 and is the only building in the world to meet four of the world’s highest green building standards: Living Building Challenge, LEED Platinum, SITES four-star certification, and Platinum WELL Building Standard. During construction of the CSL, we began offsetting all the carbon produced in heating our buildings. In 2015, we opened our second net-positive energy building, the modular SEED Classroom, and we are now working on our third. As these new buildings opened to visitors and we began to frame our messages to the public, we became concerned with the inconsistency of talking about climate change, the need to support renewable energy sources, and the need to reduce fossil fuel use, while simultaneously accepting sponsorship from fossil fuel companies. So in 2014, we stopped taking money from these companies. We then learned about the divestment movement but were confronted with the question of where to draw the line. Should we divest only from extraction companies? What about companies transporting the fuel or providing equipment? In September 2015, an answer came in the form of the Carbon Underground 2015 list produced by Fossil Free Indexes, which lists the world’s top 200 public companies ranked by the carbon content of their fossil fuel reserves. This list is fast becoming the standard by which many organizations are divesting from fossil fuels. Once we had a logical place to draw the line, we acted quickly: we confirmed that our portfolio could be changed and approached our executive and finance committees. Both committees were largely supportive but concerned with how the decision would be viewed by the public, as Western Pennsylvania is a major area for coal mining and natural gas extraction via fracking. In presenting our case to the committees, we framed the discussion around the past decade of great strides in making our organization and operations sustainable. We also pointed out a history of continuously trying to align our operations with our mission and values. The message was clear: it simply did not make sense to invest in fossil fuel extraction. In late October 2015, our board unanimously passed a resolution to make our investments more reflective of our mission and values. They also decided that instead of framing the decision in the negative context of divesting, they would reframe it in the positive terms of reinvesting in renewable energy. They also went further and identified this as a first step in a much larger initiative for socially responsible investing. Over the next two years, we will evaluate other criteria typically used in social investing and select those that align with our mission and values. Our investments in the sustainable energy sector provide one more important step in our ongoing evolution, paving the way for even greater accomplishments to come. For 120 years, Phipps has excelled in showcasing beauty. Today, this history of excellence serves as a platform to demonstrate that people, plants, health, planet, and beauty are inextricably connected. Phipps’ long-term goal is to take a more socially responsible view of all its activities to make sure they reflect our mission and values. Reinvesting our fossil fuel investments into renewable energy was the right thing to do—and just as importantly, it was the logical next step, made possible by our consistency, momentum, and dedication to our sustainability mission. As we considered our mission and values at Phipps Conservatory and Botanical Gardens, we discussed our rationale for making changes to our energy sector investments. The following points may prove helpful to stimulate discussion—and action—at your institution. • Lead by example. If we don’t, why should anyone follow what science centers and museums say? • Build credibility over time by walking the walk and talking the talk. This was the single most important reason we were able to make the decision to divest so quickly. • Be authentic and transparent. The public can see through the inconsistencies when we say one thing yet do another. • Consider the magnitude. Climate change is an issue that will impact everyone. There are no ivory towers in which to hide. • Ask tough questions. Yes, money is important; we all need to raise money to operate, but we also have to ask, How do we want to make our money? Some things we just shouldn’t do: profiting from the extraction and burning of fossil fuels is one of them. • Build an environment that reflects your values. We need to stop making excuses for not building to the highest standards of green buildings. These excuses are based on outdated methods of determining payback and costs. • Think of today. Our health and well-being, as well as that of future generations, is based on how well we treat the environment now. • Think of tomorrow. As leaders of trusted institutions in our communities, what story will we tell our children and grandchildren 20 years from now, when they ask what we did to try and stop climate change when we had the chance to stop it? • Consider this fact: the generations alive today are the first to realize we have a problem with climate change, and they are also the last ones that can do something about it. Richard V. Piacentini is executive director of Phipps Conservatory and Botanical Gardens in Pittsburgh, Pennsylvania. About the image: The SEED classroom is Phipps Conservatory and Botanical Gardens’ second net-positive energy building. Photo courtesy Banko Media, Inc.